The energy storage system and associated electrical substation installation at Buzen Power Plant are shown below. The energy storage system is comprised of 63 4-module units, where each module contains sodium-sulfur (NaS) batteries with a rated output of 200 kW. The modules are double stacked to reduce the facility’s footprint and cost. 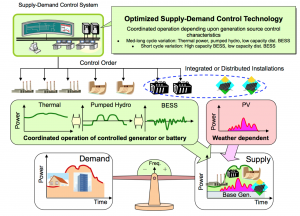 The following simplified diagram shows how the Mitsubishi grid supervisory control and data acquisition (SCADA) system matches supply with variable demand on a grid with three dispatchable energy sources (thermal, pumped hydro and battery storage) and one non-dispatchable (intermittent) energy source (solar photovoltaic, PV). As demand varies through the day, thermal power plants can maneuver (within limits) to meet increasing load demand, supplemented by pumped hydro and battery storage to meet peak demands and to respond to the short-term variability of power from PV generators. A short-term power excess is used to recharge the batteries. Pumped hydro typically is recharged over night, when the system load demand is lower. 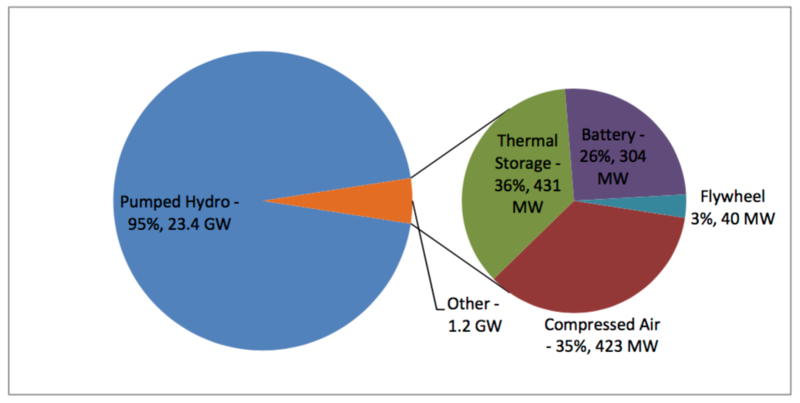 This 2013 report includes the following figure, which shows the rated power of U.S. grid storage projects, including announced projects. 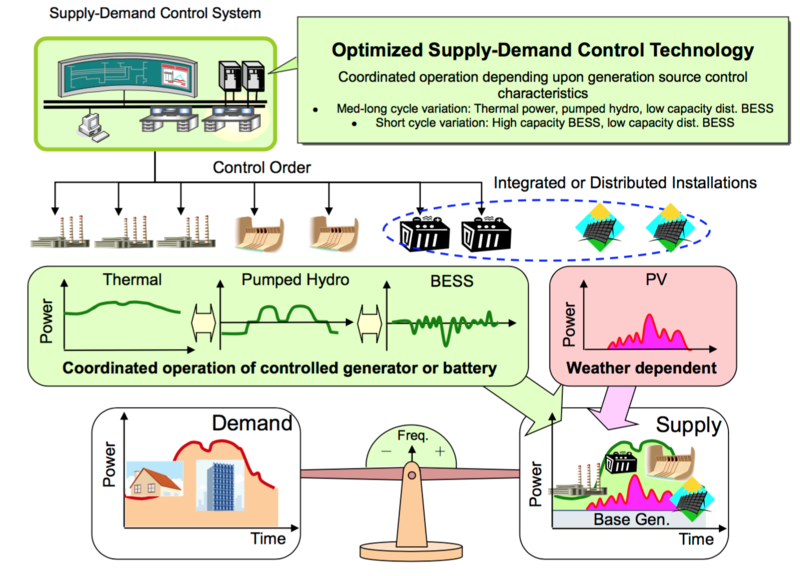 As you can see, battery storage systems, such as the Mitsubishi system at Buzen Power Plant, comprise only a small fraction of grid-connected energy storage systems, which currently are dominated in the U.S. by pumped hydro systems. DOE reported that, as of August 2013, there were 202 energy storage systems deployed in the U.S. with a total installed power rating of 24.6 GW. Energy storage capacity (i.e., GWh) was not stated. In contrast, total U.S. installed generating capacity in 2013 was over 1,000 GW, so fully-charged storage systems can support about 2.4% of the nation’s load demand for a short period of time. Using the DOE near-term cost goals, we can estimate the cost of the energy storage system at the Buzen Power Plant to be in the range from $75 – 87.5 million. DOE estimated that the storage devices contributed 30 – 40% of the cost of an energy storage system. That becomes a recurring operating cost when the storage devices reach their cycle life limit and need to be replaced. Currently there are 86 GW of intermittent power sources connected to the U.S. grid and that total is growing year-on-year. As shown below, EIA expects 28% growth in solar generation and 16% growth in wind generation in the U.S. in 2016. The reason we need dispatchable grid storage systems is because of the proliferation of grid-connected intermittent generators and the need for grid operators to manage grid stability regionally and across the nation. The “eligible renewable energy resources” include solar, wind, and other resources, several of which would not be intermittent generators. In 2014, the installed capacity of California’s 1,051 in-state power plants (greater than 0.1 megawatts – MW) was 86.9 GW. These plants produced 198,908 GWh of electricity in 2014. An additional 97,735 GWh (about 33%) was imported from out-of-state generators, yielding a 2014 statewide total electricity consumption of almost 300,000 GWh of electricity. By 2030, 50% of total generation is mandated to be from “eligible renewable energy resources,” and a good fraction of those resources will be operating intermittently at average capacity factors in the range from 22 – 33%. The rates we pay as electric power customers in California already are among the highest in the nation, largely because of the Renewables Portfolio Standard (RPS) Program. With the higher targets for 2030, we soon will be paying even more for the deployment, operation and maintenance of massive new grid-connected storage infrastructure that will be needed to keep the state and regional grids stable. In my 10 March 2015 post, I provided basic information of the remarkable Solar Impulse 2 aircraft and its mission to be the first aircraft to fly around the world on solar power. 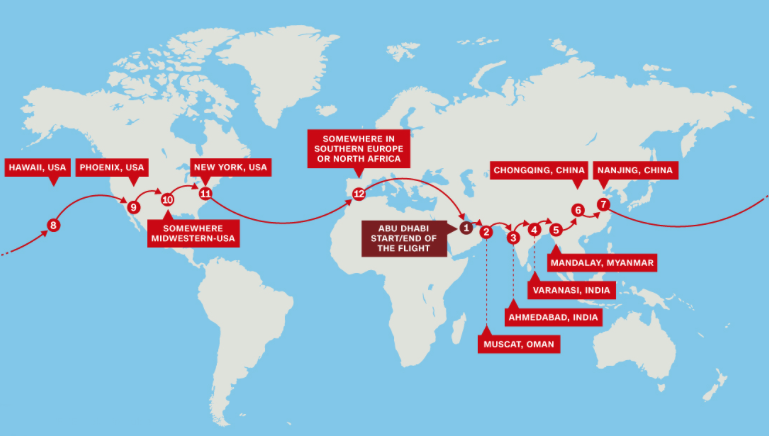 On 10 July 2015, I posted a summary of the first eight legs of the around the world flight, which started in Abu Dhabi on 9 March 2015 and ended on 3 July at Kalaeloa, a small airport outside Honolulu, Hawaii. “Since the plane had been exposed to harsh weather conditions from Nanjing to Nagoya, we decided to do a test flight before leaving for Hawaii. Having to perform a test flight followed by a mission flight had not been taken into account in the design process of the battery system, which did not allow the batteries to cool down in between the two” (flights). A further delay in starting Leg 9 was caused by the seasonal shortening of daylight hours in the Northern hemisphere. The late autumn and winter daylight hours weren’t long enough to allow the batteries to be fully recharged during the day along the planned route to the U.S. mainland and back to Abu Dhabi. 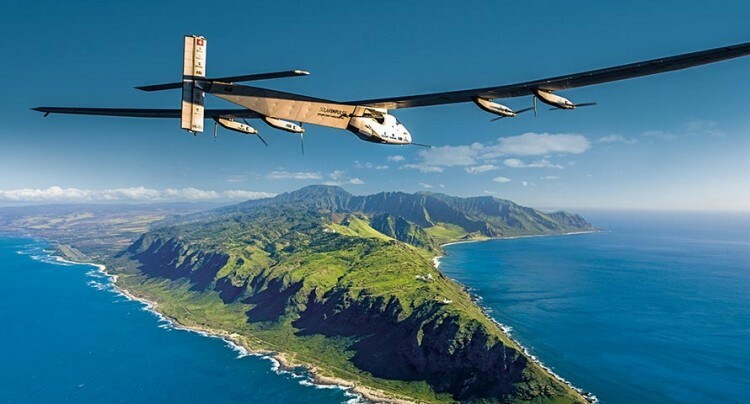 On 26 February 2016, the upgraded Solar Impulse II made a successful “maintenance” flight in Hawaii. The flight lasted 93 minutes, reached an altitude of 8,000 feet (2,400 meters), and included tests of the stabilization and battery cooling systems. Solar Impulse is planning to restart its around-the-world journey on 20 April 2016. Is EPA Fudging the Numbers for its Carbon Regulation? U.S. Energy Information Agency’s (EIA) Annual Energy Outlook (AEO) is the data source usually used by federal government agencies in their analysis of energy issues. EPA stands out as an exception. It frequently chooses not to use EIA data, and instead develops it’s own duplicative, different data. In the case of the Clean Power Plan, the EPA’s own data significantly underestimates the number of coal plants that need to be retired to comply with the Plan. The result is a much lower estimate of the economic impact of the Plan than if EIA data had been used. On 8 February 2016, the American Nuclear Society (ANS) released their, “Nuclear in the States Toolkit Version 1.0 – Policy Options for States Considering the Role of Nuclear Power in Their Energy Mix.” The toolkit catalogs policies related to new and existing nuclear reactors for state policymakers to consider as they draft their Clean Power Plan compliance strategies. The Toolkit identifies a range of policy options that individually or in aggregate can make nuclear generation a more attractive generation alternative for states and utilities. On 9 February 2016, the U.S. Supreme Court issues a stay on implementation of the EPA’s Clean Power Plan (CPP) pending the resolution of legal challenges to the program in court. What are the Sources of Electric Power in the USA? The sources of electric power used in California have changed significantly between 2004 and 2014. 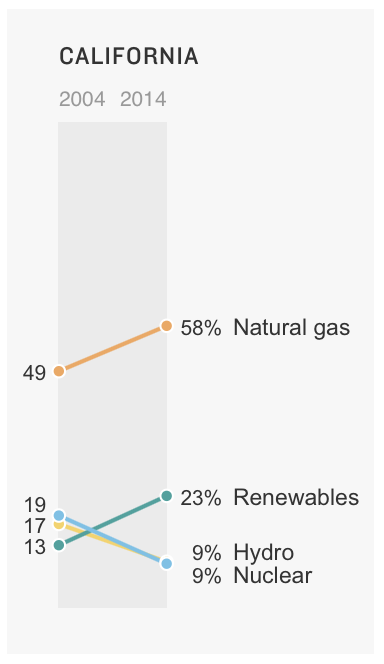 The distribution of California’s energy sources, among natural gas, renewables (wind & solar), hydroelectric, and nuclear is shown in the following chart. 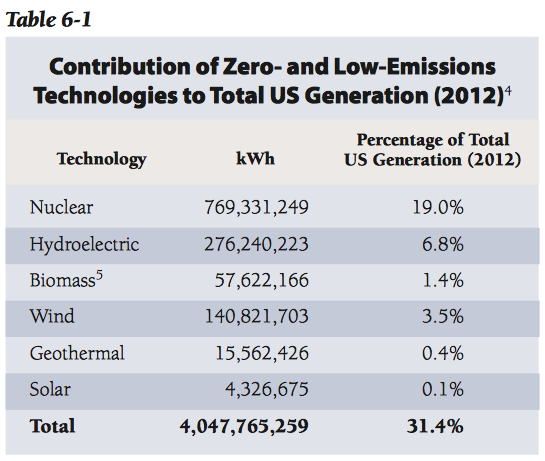 California does not use coal or petroleum to generate electric power. 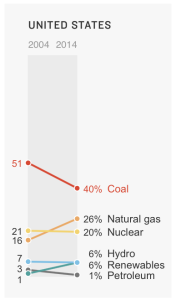 Nationally, on a percentage basis, coal use is on the decline and use of natural gas and renewables is on the increase in most states. Check out the following NPR website, which is the source of the above charts, to see similar charts for all 50 states. MidAmerican Energy Company, Iowa’s largest energy company, began installing wind turbines in 2004. 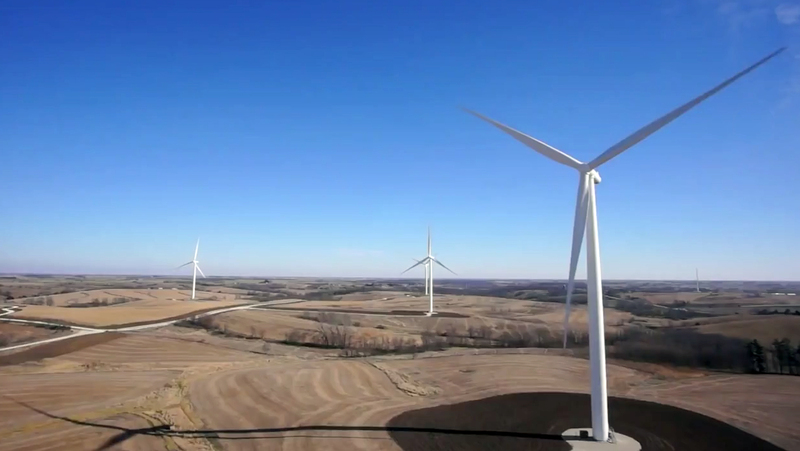 In May 2013, MidAmerican Energy announced their latest plan to invest up to $1.9 billion to expand its wind generation fleet and add up to 1,050 MWe of wind generation in Iowa by year-end 2015. Once this expansion is complete, approximately 3,335 MWe, or approximately 39%, of MidAmerican Energy’s total owned generation capacity will come from wind-powered generation from 1,715 wind turbines. 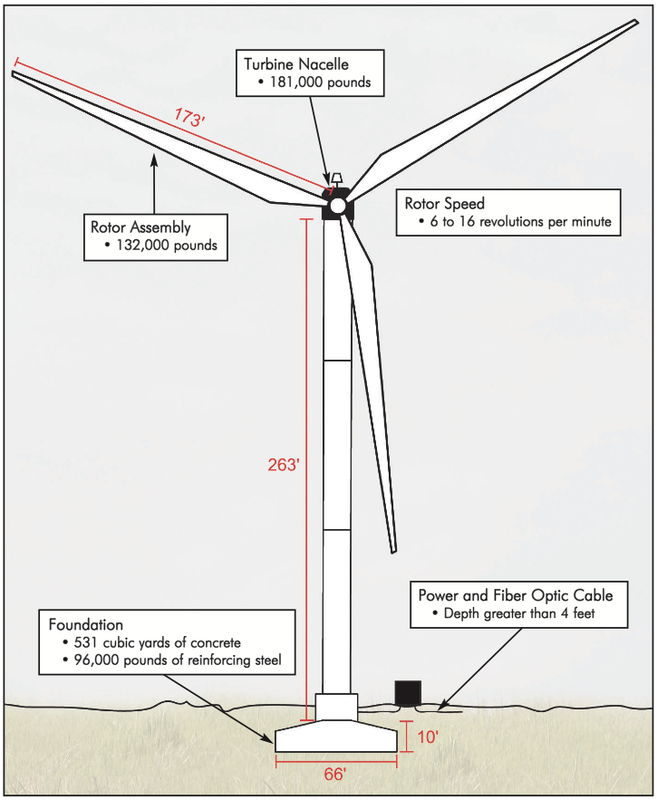 Now complete this process several hundred times and you have a respectable sized wind farm. “Capacity factors describe how intensively a fleet of generators is run. A capacity factor near 100% means a fleet is operating nearly all of the time. It is the ratio of a fleet’s actual generation to its maximum potential generation”. 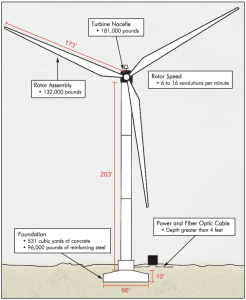 As a renewable power source, wind has a significantly higher capacity factor than solar. However, over the long term, a wind farm delivers only about one-third of it’s “nameplate rating.” This statistic, of course, does not capture the real-time variability in electrical output as wind conditions constantly change. 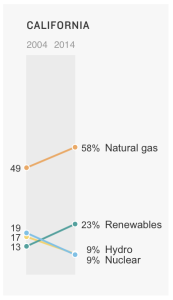 Wind and solar power are the preferred EPA options. Natural gas is an interim solution. New nuclear capacity is not a compliance option. I’ve already formed my opinion on the Clean Power Plan. To help you form your opinion, I recommend that you refer to the following recent analyses by four respected government and industry organizations that have reviewed the Clean Power Plan. On 15 June 2015, the IER issued the results of their analysis entitled, EPA’s Clean Power Plan Ignores New Nuclear as a Compliance Option. IER concluded that the compliance formulae in the Clean Power Plan are biased toward new wind and solar power development. 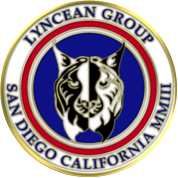 Deployment of these technologies, which currently are not capable of delivering reliable capacity, will decrease the reliability of the electric grid. IER also concluded that the Clean Power Plan will result in much higher electricity prices for all American consumers, while having only a marginal impact on global temperature based on EPA’s computer models. On 21 May 2015, the NACAA issued a report entitled, Implementing EPA’s Clean Power Plan: A Menu of Options, containing 25 chapters, each of which explores a particular approach to greenhouse gas (GHG) reduction in the electric power sector. NACAA is a nonpartisan, nonprofit association of air pollution control agencies in 41 states, the District of Columbia, four territories and 116 metropolitan areas. Each chapter of their Menu of Options includes a brief descriptions of: (1) the option and it’s pros and cons; (2) the regulatory backdrop, policy underpinnings, implementation experience, and GHG reduction potential associated with the option; and (3) benefits of the option to society and the utility system, including costs and cost-effectiveness. In the last chapter, a variety of emerging technologies and other policy options for reducing GHG emissions are addressed. An interesting table and two figures included in Chapter 6 of the Menu of Options are reproduced below. 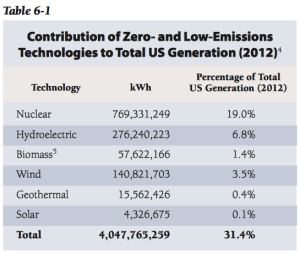 In 2012, electric power generation technologies with zero or low GHG emissions accounted for 31.4% of the USA’s total generating capacity. The data in Table 6-1 shows that 82.2% of the zero or low GHG emission generating capacity came from nuclear and hydroelectric power plants. The remaining low-emission generation capacity came from biomass, wind, geothermal, and solar power plants. In Figure 6-3, “life cycle GHG emissions” include those associated with operation as well as construction, fabrication, and fuel processing. 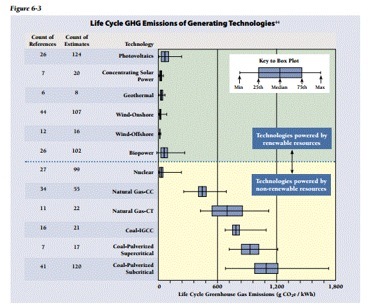 While nuclear power is not included among the “technologies powered by renewable resources”, it’s clear in Figure 6-3 that nuclear power meets the GHG reduction performance of the other technologies using renewable resources. 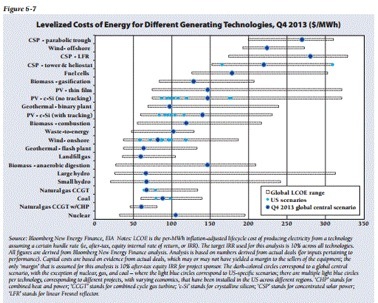 In Figure 6-7, note the relative cost-of-energy differential between nuclear power and fossil power. 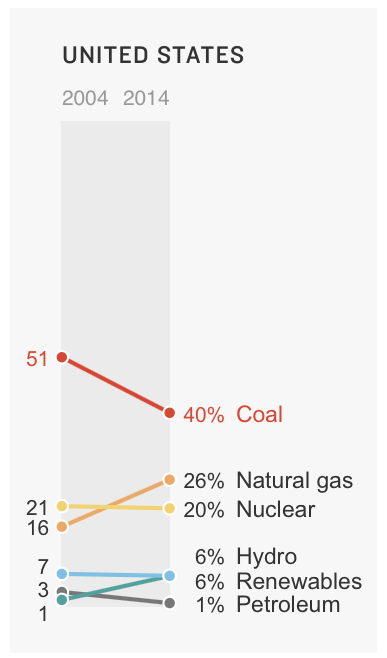 This difference makes it difficult for nuclear power plants to compete head-to-head with coal and natural gas merchant power plants and encourages the early retirement of some nuclear power plants on economic grounds. While most renewable power sources have even higher costs-of-energy, various financial schemes subsidize their power generation. On 22 May 2015, the EIA released their analysis of the Clean Power Plan. The EIA analysis supports the IER finding that the Clean Power Plan will result in much higher electricity prices for all American consumers, even in a scenario that allows GHG reduction credit for new nuclear generation. “Nuclear energy facilities avoided 595 million metric tons of carbon dioxide in 2014 across the U.S. This is nearly as much carbon dioxide as is released from nearly 135 million cars, which is more than all U.S. passenger cars. The U.S. produces more than five billion metric tons of carbon dioxide each year. 2013 paper, “Prevented Mortality and Greenhouse Gas Emissions from Historical and Projected Nuclear Power”. So, what do you think about the EPA’s proposed Clean Power Plan? Is this the “common sense plan to cut carbon pollution from power plants” promised by EPA; a politically motivated piece of crap designed to kill the nuclear and coal power industries; or something in between? On 9 March 2015, Siemens announced that it had achieved a generation efficiency record at the Cengiz Enerji Samsun combined-cycle gas turbine power plant in Turkey. With an installed capacity of 600 MWe, this plant achieves a net efficiency of almost 61%. This makes Cengiz Enerji Samsun the most efficient fossil-fired 50 Hz power plant in 2015, not only in Turkey, but in the world. 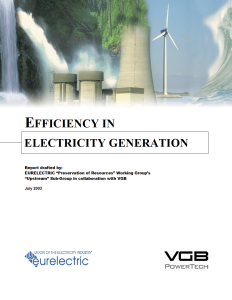 If you wonder how this level of generation efficiency compares to other types of electric power generators, then I recommend that you read the July 2003 report, “Efficiency in Electric Power Generation,” drafted by Union of the Electricity Industry – EURELECTRIC (Brussels, Belgium) and VGB PowerTech (Essen, Germany). The link you need should be at or near the top of your search results. 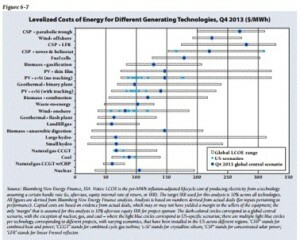 One of the key results presented in this report is a chart showing comparative efficiencies. The new Cengiz Enerji Samsun power plant raises the bar a few percentage points for “Large gas fired CCGT power plant”. 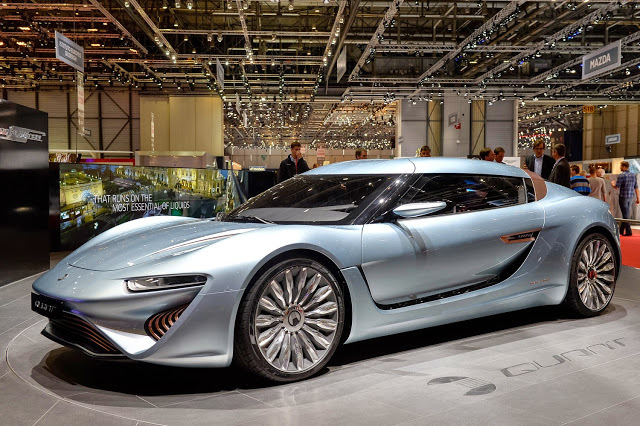 Here’s a great looking new German all-electric car that was introduced at the March 2014 Geneva Auto Show. It’s a “research” car, not for sale, but an interesting preview of a possible future application of this battery technology in production cars. The flow cell battery capacity in the e-Sportlimousine is reported to be 120 kWh. Compare this to current all-electric cars using lithium-ion battery technology: the Tesla Model S has an 85 kWh battery and a Nissan Leaf has a 24 kWh battery.